Romans 1:3 and the virgin birth. If Jesus is descended from David according to the flesh then it means he is descended from Joseph as it is Joseph who is stated to be descended from David in both genealogies (Luke 3:23-38 and Matthew 1:1–17). There have been a number of historic attempts to get round this. Augustine (in, De consensu evangelistarum On the Harmony of the Gospels , pp. 2.1.2–4) states that it is sufficient that Jesus was the adopted son of Joseph as this confers the same lineage in Jewish legal terms. I think the use of γενομενου here rules this out as that is clearly meaning born. The tantalising use of σπερματος could be misunderstood, but the whole phrase does seem to emphasise physical descent. Tertullian, argued that Jesus was descended from David through his mother Mary. However his argument is circular reasoning based on Romans 1:3. In other words "if Paul said it was descent by flesh then we must be misunderstanding the genealogies and they relate to Mary not Joseph". The problem we have here is not the divergence of the two genealogies, but the divergence of Paul from modern Christian theology. Paul clearly thought Jesus was descended from David. It may be that his emphasis on spiritual descent is an attempt to reinforce opposition to the gnostic idea that Jesus was solely spiritual. The importance of his descent from David is the idea of kingship and this is clearly the important point for Paul rather than the virgin birth. This means that even int he best case scenario the Yes campaign will need to persuade 12% of don't knows and 1% of no voters - just to get to 50%. At worst they will need to persuade 6% of the No vote to switch sides as well as gaining all the don't knows. My prediction is that the vote will probably be NO to independence, unless the Yes campaign can come up with a compelling reason why being, in effect, a crown dependency is really independence or that having some sort of semi independence from the rest of the UK is better than the current devolution arrangements. These are fairly fundamental issues and I don't think that the commonwealth games or another year of homecoming will make any great difference to the outcome. There is a real risk that a Conservative government in London would take the opportunity (no doubt fueled by their back benchers) to slash and burn public services north of the border. The SNP vote would largely collapse. Where that vote ends up will be crucial. Labour will take a lot of it but the Greens and Liberal Democrats could gain from it in some areas. Talk of independence would die away for a number of years and there would be greater concentration on gaining more powers for Holyrood and possibly greater independence for the UK political parties Scottish sections. Although it could go the other way and head towards more centralisation of party structures in England. Right now i am willing to bet on a No vote, but you can never tell what is round the corner. One thing is sure though: no matter how the vote goes things will never be quite the same again. Polling figures do not seem to have improved for the Yes campaign. The most favourable poll for the Yes campaign during December 2013 was one conducted by Ipsos MORI for STV on 5th December. The general trend has been less favourable. If this poll is accurate then the Yes campaign still have to persuade all of the don't knows and 7% of the No voters to vote Yes in the referendum. See my article on how £500 could swing the result of the referendum. Soda bread originates in Ireland where the local wheat strains were usually too soft to use for yeast breads. Soda bread is made from the same plain flour you would use for biscuits and pastry with bicarbonate of soda as a raising agent. You do not need expensive flour. I use supermarket’s own brand cheapest flour for this. 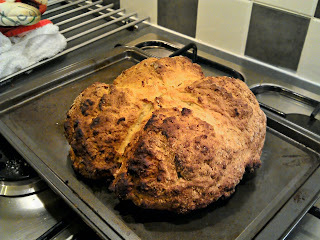 I have reviewed a number of recipes for soda bread. Most require buttermilk which I am unable to find in a local supermarket. I have substituted this with plain yoghurt (supermarkets cheapest), There is also some disparity about the amount of bicarbonate of soda. Some recipes say one teaspoon, some say two, so I have opted for two level teaspoons which should be somewhere in between. It takes about 15 minutes to heat up the oven and make the dough plus a further 40 minutes to bake it. Because there is no yeast you don’t need to wait for rising and proving prior to baking. Put the oven on at 200C (190C for a fan assisted oven). Wait until the oven is nearly at the correct temperature. Put the flour in a mixing bowl. Add the salt and bicarbonate of soda. Add the yoghurt a bit at a time and stir in using a table knife. Bring in more of the flour and keep adding more yoghurt until you have a dough with no flour left (you should need between 400 and 500 ml of yoghurt to achieve this). It doesnt matter if the dough is slightly on the wet side as long as its workable into a ball. Empty the dough onto a floured board and bring it together into a round lump. Do NOT knead it other than folding it over to form it into a lump and make it the correct shape). Place the dough on the baking tray. Take a wooden spoon, put some flour over the whole handle, then put it on top of the bread, push it down until you feel the baking tray at the bottom, then turn it 90 degrees and do the same again. Bake in the oven for 40 to 50 minutes at 200C (190C for fan assisted ovens) or until it is baked and tapping on the bottom of the loaf makes a hollow sound. The bread will rize to about twice its original size. For a brown loaf use 370g white flour and 130g wholemeal flour. Has anyone else had problems with a company called the Moorcroft Group recovering debts on behalf of Virgin Media? Following the 2012 presidential election many Christians are seeing the election of Barak Obama as a sign of the "end times" and pointing to his apparent Muslim faith as evidence that he is some sort of antichrist figure. According to a survey by Public Policy Polling in 2011, a majority of Republicans in Alabama and Mississippi believed that President Obama was a Muslim. In Alabama, 45% of Republican voters thought Obama was a Muslim, while 41%were not sure. I hate to disappoint people, but Obama is actually a Christian. His embrace of faith was a sharp change for a man whose family offered him something of a crash course in comparative religion but no belief to call his own. "He comes from a very secular, skeptical family," said Jim Wallis, a Christian antipoverty activist and longtime friend of Mr. Obama. "His faith is really a personal and an adult choice. His is a conversion story." "I remained a reluctant skeptic, doubtful of my own motives, wary of expedient conversion, having too many quarrels with God to accept a salvation too easily won," he wrote in his first book, "Dreams From My Father." It was a 1988 sermon called "The Audacity to Hope" that turned Mr. Obama, in his late 20s, from spiritual outsider to enthusiastic churchgoer. Mr. Wright in the sermon jumped from 19th-century art to his own youthful brushes with crime and Islam to illustrate faith's power to inspire underdogs. Mr. Obama was seeing the same thing in public housing projects where poor residents sustained themselves through sheer belief. In "Dreams From My Father," Mr. Obama described his teary-eyed reaction to the minister's words. "Inside the thousands of churches across the city, I imagined the stories of ordinary black people merging with the stories of David and Goliath, Moses and Pharaoh, the Christians in the lion's den, Ezekiel's field of dry bones," Mr. Obama wrote. "Those stories — of survival, and freedom, and hope — became our story, my story." Mr. Obama has written that when he became a Christian, he "felt God's spirit beckoning" and "submitted myself to His will and dedicated myself to discovering His truth." While he has said he shares core Christian beliefs in God and in Jesus as his resurrected son, he sometimes mentions doubts. Meaning that if Obama has been baptised as a Christian, made a confession of faith, and believes in the resurrection he has done exactly what you are tryng to persuade people to do through your evangelistic activities. He is just as Christian as all those people you have been involved in converting. He is also just as much a Christian as those people from around the world who you hold up as examples of persecuted Christians - catholics, orthodox and coptic - although you rarely mention Palestinian Christians). However, the fact that President Obama is a Christian does not mean you have to agree with his policies. You may not agree with Obama's policies, but that doesn't stop him being a Christian or make him a Muslim. The biggest problem facing humanity today is our inability to continue liking someone with whom we disagree on some political or religious issue. We see it in religious, political and our own social circles where people are congregating in smaller and smaller groups of only like minded people. People seem to feel endangered by ideas they disagree with and distrust those who think differently. They only way they seem to be able to cope is by demonising those they disagree with. Lets remember how Jesus acted. He was not scared of associating with people who had other ideas, were of other religions or even oppressors. This silent newsreel clip is from 1930 and is an early one for a brass band. The band was also known as GWR & Paddington Borough Silver Prize Band. Click on the image below to go to the British Pathe web site and view the clip.